West Covina, Calif.-based Foothill Transit is executing an option to purchase 30 compressed natural gas (CNG) 42-foot vehicles from North American Bus Industries (NABI) for a total of approximately $17.1 million. 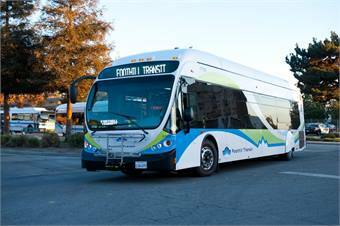 The new vehicles will be outfitted with what is being called the “new standard” — high-backed, reclining seats, adjustable reading lights, ample overhead parcel racks and Foothill Transit’s new exterior livery. Federal Transit Administration guidelines stipulate that buses purchased with federal funds must remain in service for 12 years or 500,000 miles, whichever comes first. Foothill Transit currently has 30 buses that will reach that threshold by the end of 2014. The 30 new NABI buses will replace the aging coaches. Foothill Transit began converting its 330-bus fleet to CNG-fueled buses in 2002. It retired its last diesel bus in December 2013. The buses will carry 38 customers and will also have advanced vehicle location technology and exterior bicycle racks on board. Expected delivery is December 2014.